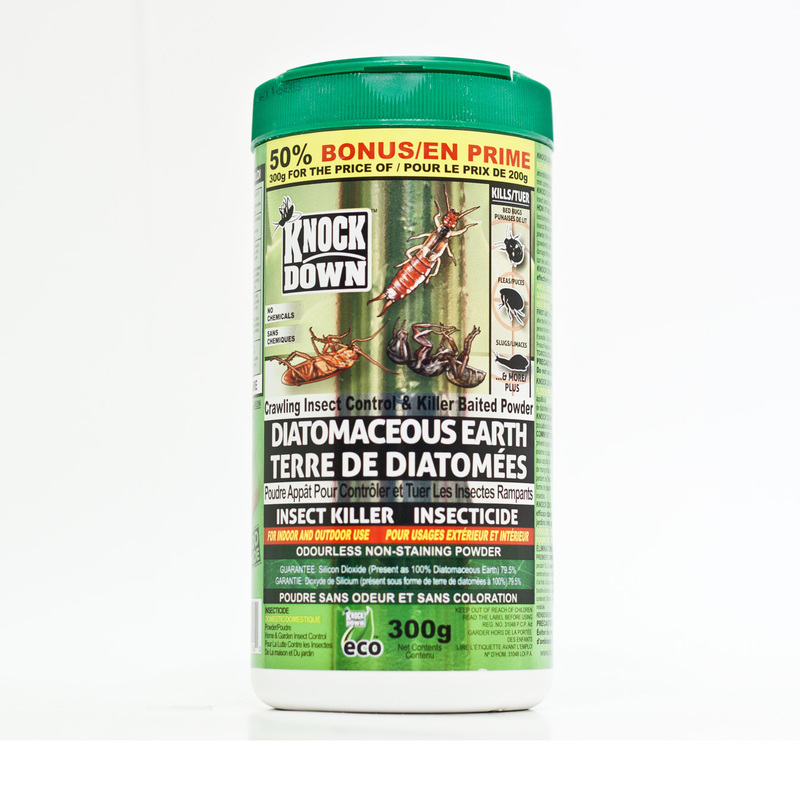 KD160D – KNOCK DOWN – DIATOMACEOUS EARTH -300G – KUUS Inc.
All purpose insecticide – formulated using FOOD GRADE natural fresh water Diatomaceous Earth (DE) along with two food grade baits. ALWAYS READ THE LABEL CAREFULLY BEFORE USE. THIS PRODUCT IS NOT INTENDED FOR HUMAN OR ANIMAL CONSUMPTION. DO NOT CONSUME. 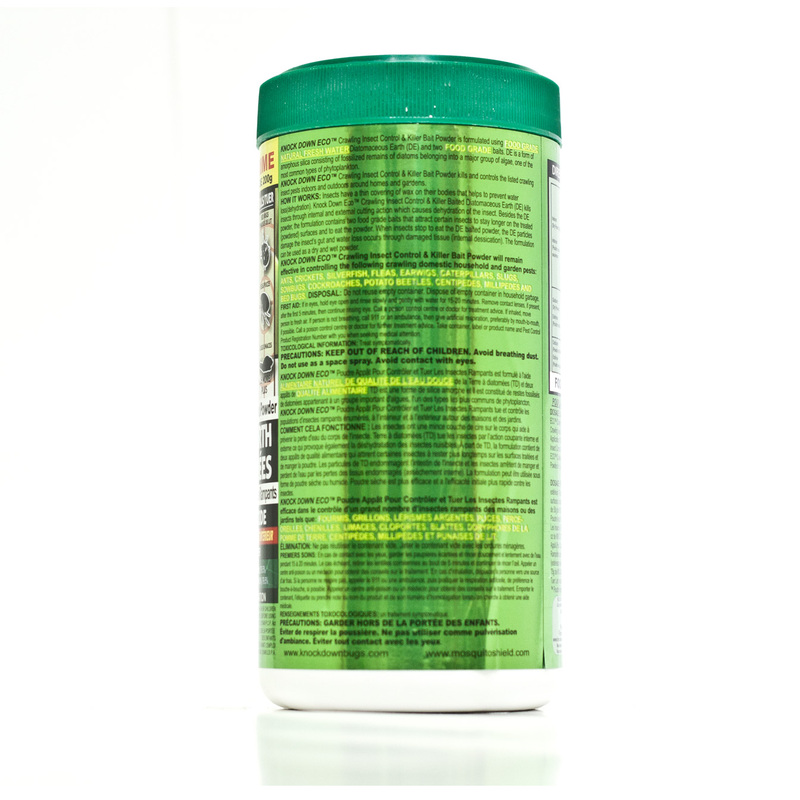 If used inappropriately, any pest control product, including those with natural ingredients, may have health, safety or environmental risks: use this product only in accordance with label instructions. KNOCK DOWN ECO Crawling Insect Control & Killer Bait Powder is formulated using food grade natural fresh water Diatomaceous Earth (DE) and two food grade baits. DE is a form of amorphous silica consists of fossilized remains of diatoms belonging into a major group of algae, one of the most common types of phytoplankton. 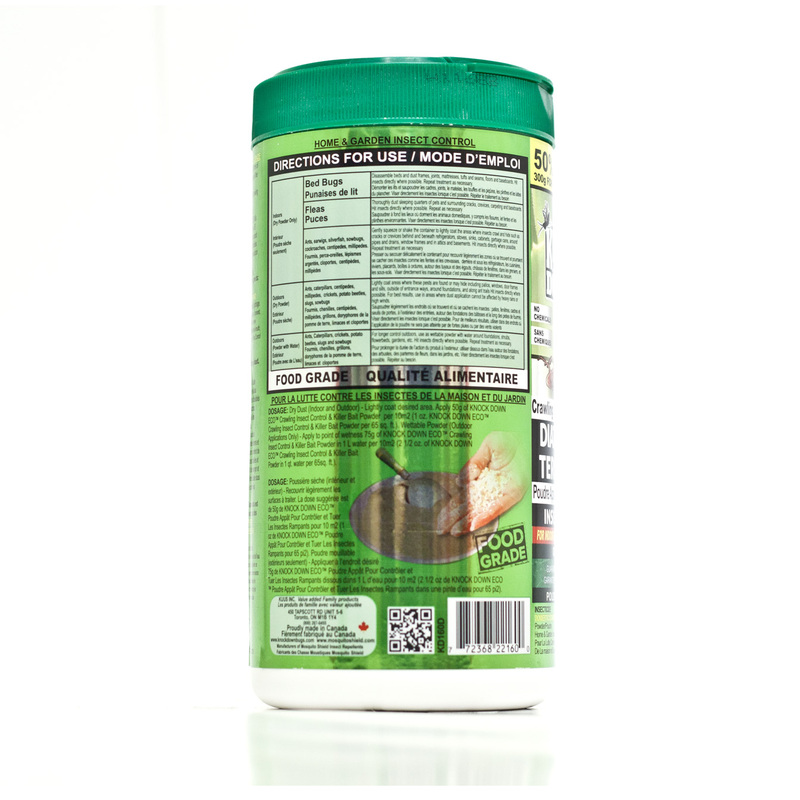 KNOCK DOWN ECO Crawling Insect Control & Killer Bait Powder kills and controls the listed crawling insect pests indoors and outdoors around homes and gardens. HOW IT WORKS: Insects have a thin covering of wax on their body that helps to prevent water loss from the insect’s body. Diatomaceous Earth (DE) kills insects through internal and external cutting action, which also causes dehydration of insect pests. Beside DE, the formulation contains of two food grade baits that attracts certain insects to stay longer on treated surfaces and to eat the powder. DE particles damage the insect’s gut and insects stop to eat and losses water through damaged tissue (internal desiccation). The formulation can be used as a dry or wet powder.